It's time for this week's Stampotique Designer's Challenge! We are wishing you all a Merry Christmas and have enjoyed having you along for our challenges this year. We can't wait to ring in 2013 with us as well. Here's my little ornament featuring another adorable Stampotique owl. Hoo am I kidding, I just can't get enough of them!! LOL! 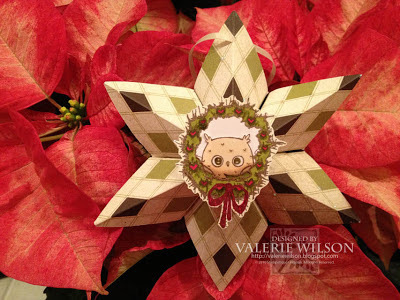 :) He's hiding in the fabulous new Stampotique Christmas wreath designed by Daniel Torrent! This fabulous star is made from a single square piece of paper folded like a fan and then pulled together at each end. Check out Jen's great tutorial at Pieces of Me for step-by-step pics! I wanted to wish you a Happy New Year-!!! Wishing you the brilliance to face your most wonderful creations and dwell on your dreams in 2013.